Rabbit Ears Pass is a high mountain pass in the Colorado Rockies along the Continental Divide. 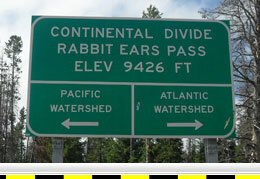 Rabbit Ears' west summit is located on U.S. Highway 40, 14 miles east of Steamboat Springs, Colorado. Rabbit Ears' east summit is approximately 8 miles from the west summit, and U.S. Highway 40 between the east and west summits consists mainly of rolling hills with some short grade descents. U.S. Highway 40 is the northern route across the state of Colorado and connects I-70 with Salt Lake City, Utah. U.S. Highway 40, on both sides of Rabbit Ears Summit is a steep, windy descent. Rabbit Ears Pass receives a large amount of snow in the winter and may have chain restrictions for commercial trucks or be closed for snow control. Westbound U.S. 40 from the Rabbit Ears Summit has a vertical descent of 2,467 feet over a distance of approximately 7.5 miles. The reported grade for the westbound descent is 7%. 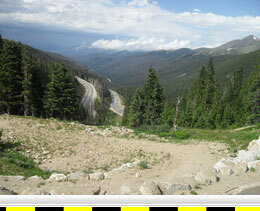 The calculated average grade for this descent is 6.2%, and the steepest measured grade is 7.2%. 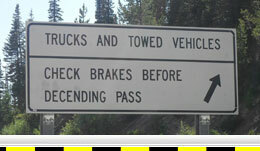 Westbound Rabbit Ears Pass has numerous advisory curves with the lowest being marked at 40 mph, at about 5.8 miles west of the west summit. Eastbound U.S. 40 from the Rabbit Ears Summit has a vertical descent of 1,197 feet over a distance of approximately 5.5 miles. The eastbound descent is much milder than the westbound with a 4.1% average grade and four advisory curves with only one having an advisory speed (45 mph). The summit of Muddy Pass is approximately 3 miles east of the east summit Rabbit Ears Pass. Or stated differently, Muddy Pass is about halfway down the east side of Rabbit Ears Pass. Muddy Pass is effectively the pass between the junction of U.S. 40 and Colorado State Highway 14, and therefore, the eastbound descent from Muddy Pass is simply the continuation of the eastbound descent from Rabbit Ears Pass. Summit Elevation: West Summit 9,400 ft.